Let’s face it: the RV lifestyle comes with a few unique challenges. Space is at a premium, and gear is often subjected to the stresses of travel. The gear chosen should compliment our travels, not get in the way! 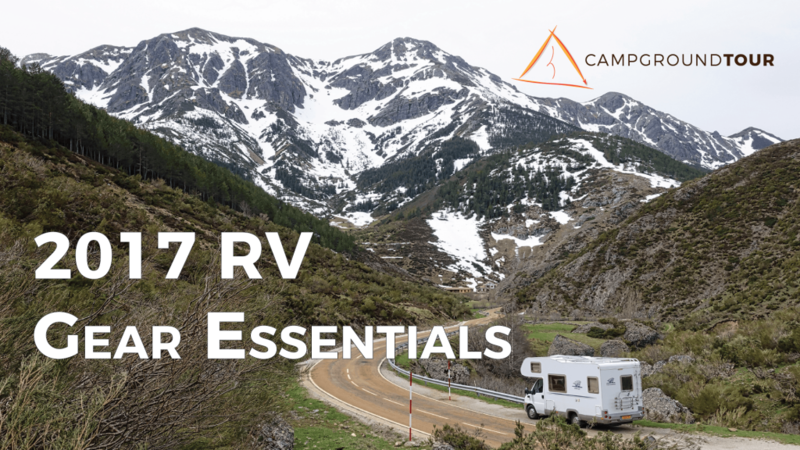 At CampgroundTour, we have sifted through the hype, and present the following collection of best RV accessories, updated for 2017! Looking to re-supply for another summer of RV exploration? Are you a long-time RV aficionado? Either way, we hope you find a hidden gem to make life on the road that much easier! In today’s connected world, focusing on quality electronics may be one of the best RV accessories you invest in. Many RV enthusiasts can relate to the struggle to find quality connectivity while mobile. Often, connecting a wireless booster or antenna to your laptop alone is not sufficient since many RVs are constructed with aluminum skin or bracing within the walls. These walls can block wireless signals, making cell phones and laptop connectivity a challenge! In addition to boosting signal coverage, consider making navigation a breeze with the addition of a GPS. Navigating foreign cities can be daunting to begin with, never mind trying to navigate foreign routes in a large RV. Don’t guess the route, know the route. In addition, technology advances in mapping and route planning allow for detailed trip planning, logging, and sharing of information. This might make a fun addition to your blog, or provide data useful to determining yearly mileage. WiFiRanger SkyPro Pack When connectivity needs demand the highest reliability and flexibility, the WiFiRanger SkyPro delivers. The SkyPro is a two-piece kit: one unit providing indoor signal, while a second unit mounts to a flat surface roof to amplify signals up to 1.5 miles away. In addition, the indoor unit supports connecting a 3G/4G Aircard or MiFi device to extend wireless cellular coverage. weBoost RV 4G Cell Phone Signal Booster Boost 3G and 4G/LTE cellular signals for both voice and data. Designed specifically for RV use, this unit has an external signal antenna that is easily mounted to an RV window facing the direction of the strongest cellular network signal. Note that this product is designed for stationary use. Unit runs off 2 AA batteries, or optional AC power adapter. La Crosse Technology Wireless Atomic Digital Color Forecast Station Easily keep tabs on both inside temperature, and humidity. Also, determine the weather trend based on changing barometric pressure readings. Garmin RV 760LMT Portable GPS Navigator The Garmin RV 760 stands out among the competition with a large 7″ touchscreen display, lifetime map and traffic updates, and database of RV-specific services and vendors, such as repair shops, truck stops, and tow facilities. Magellan RoadMate RV9145-LM 7″ Touchscreen GPS Designed especially for RV, the Magellan sports a large 7″ touchscreen display, lifetime map updates. Unique to the Magellan RV9145-LM, find all U.S. and Canada campground locations in the provided Good Sam/Trailer Life database. Midland GXT1000VP4 36-Mile 50-Channel FRS/GMRS Two-Way Radio Round out your kit with a pair of two-way radios, perfect for a wide range of scenarios. Use radios to keep in touch at a large event, assist with parking, or give kids hours of endless entertainment! No roundup of the best RV accessories is complete without a look at kitchen gadgets. Cooking in a small RV kitchen doesn’t need be a frustrating experience. With a bit of planning and proper equipment, the RV kitchen can prove equally functional to that of a traditional kitchen. The gadgets below are designed with space efficiency in mind or provide a unique way to make preparing a “home”-cooked meal just as enjoyable. Instant Pot 7-in-1 Multi-Functional Pressure Cooker Make cooking a breeze with the 7-in-1 Instant Pot pressure cooker. Combining the functions of a pressure cooker, slow cooker, rice cooker, saute/browning pan, yogurt maker, steamer and warmer, this 6 quart unit is worth the space in any multi-functional RV kitchen. Most definitely a top contender among best RV accessories! Black+Decker SpaceMaker Under The Cabinet 12-Cup Programmable Coffeemaker Free up valuable counter space by mounting a coffee maker under your cabinets. This 12-cup coffee maker features a removable water reservoir and auto-brew feature for that fresh morning coffee aroma. NuWave Precision Induction Cooktop Looking to save propane when on full hookups? The NuWave induction cooktop features adjustable wattage control to maximize power efficiency, while providing the ability to boil water in 120 seconds. Keep in mind that you will need induction-compatible cookware (any cookware that a magnet would stick to should suffice!). DELLA Portable Electric Ice Maker Machine Ever tried making ice in an RV freezer? Still waiting? Never wait for ice again – as long as you have AC available, you can have ice in as little as 6-minutes with the Della Portal Ice Maker. Capable of making up to 26lbs of ice in a 24-hour period, this unit is sure to deliver relief on hot summer days. Aerobie AeroPress Coffee and Espresso Maker The AeroPress brings portable, high quality coffee to the next level. The micro filter and gentle air-pressure brewing produce a flavorful cup, perfect for lattes and espressos. Magma 10-Piece Gourmet Nesting Stainless Steel Cookware For gas, electric or ceramic cooktops, this 10-piece cookware set conveniently stores in less than 1/2 cubic feet of space. This kit includes 1.5, 2, and 3 quart sauce pans with interchangeable lids. A 5-quart stock pot, and a 9.5″ saute/frying pan complete the set. Not for use with induction cooktops (see below for a set that is!). Magma 10-Piece Gourmet Nesting Stainless Steel Cookware For use with induction cooktops, this 10-piece cookware set contains the same pans as the gas/electric counterpart above. In addition, these pans are oven and dishwasher safe! Vesper’s Kitchen Stackable Mixing Bowl Set Another solid contender for best RV accessories is this stackable mixing bowl set. This set contains mixing bowls, a colander, a measuring bowl, sifter, and measuring cups all in a compact 10.5″ x 10.4″ x 5.5″ footprint. ASSIS Pot and Pan Protectors, Set of 6 In 7″, 11″, and 15″ sizes, these pot and pan protectors fit a wide array of cookware and other fragile bakeware. Use between glass bowls, ceramic, plates and more to prevent breakage, chipping, scratching. Ultimate Kitchen Storage Under Cabinet Mini Spice Rack If you enjoy cooking, chances are you enjoy spices. The limited pantry space in RV kitchens often proves problematic when it comes to toting along your favorite food flavorings. Fear not – with the Ultimate Kitchen mini spice rack, you can tuck your spices safely away. Unit arrives unfinished to allow you to match your cabinet stain – be prepared! Thin Bins Collapsible Containers – Set of 4 Another space saver! BPA-free plastics and dishwasher-safe material make these one of the best RV accessories for the kitchen. This set of 4 stackable and collapsible containers includes a 10.5oz, 18oz, 26oz, and 43oz container. Each container collapses to 1/3 its original size for efficient storage. Prepworks by Progressive Collapsible Over-The-Sink Dish Drainer Collapsible vertically to only 1.5″ in height, this over-the-sink disk drainer can hold up to 8 plates of 10″ diameter. Additionally, place the dish drainer itself in the dishwasher for an easy, thorough cleaning. Rev-A-Shelf Double 35 Quart Pull-Out Waste Container Make trash duty a breeze by putting your kitchen trash cans on rails. Easily slide trash bins in and out of a dedicated cabinet. The age-old paradox faced by everyone who steps foot in an RV: power. Not only do you need to worry about capacity, but type is critical as well. Do I have AC available, or am I boondocking and only have DC available? Do I really want to run the generator? How about an inverter? Solar power? Also, how much a draw does that device take? As you can see, it can easily become overwhelming. Although this guide is not intended as an all-inclusive power solutions manual, common products solving various power-related needs are included below. Go Power! Solar-AE 960 Watts All Electric Solar Charging Kit All the power you should need to satisfy even the hungriest of power budgets. This kit provides 6 total 160 watt solar panels, as well as the charge controller, remote and monitor. Also includes cabling, brackets, and parts required to install in most RV applications. Go Power! 80W Portable Folding Solar Kit This portable solar charge kit includes a built-in 10A solar controller, allowing for a non-permanent installation. Take the included solar panels out of their carrying case and connect to your battery bank. Go Power! GP-MSH3012M-PKG 3000 Watt Pure Sine Wave Hybrid Magnum Inverter with Remote Charger and Fuse Block Package A perfect compliment to a full solar-panel array, this 3,000 watt hybrid inverter will draw power from both shore power and batteries, simplifying the power situation anywhere you cannot connect to a 50A service. Nekteck Dual USB Port Portable Solar Charger For smaller device charging, this combination solar charger and battery pack provides 10,000mAh (milli-amp hours). Comes with both a 1.0A and 2.1A USB port for charging devices, as well as a Micro-USB port to allow for charging the battery pack from an external source (such as a laptop). Finally, we explore a number of products designed to enhance the RV itself. Safety and security are front and center – road travel can present unexpected surprises around every turn. Tackle any number of different challenges with confidence by outfitting your RV with product ideas presented below. TireMinder A1A Tire Pressure Monitoring System (TPMS) Don’t be left guessing when it comes to tire inflation. One of the best RV accessories to ensure a safe trip is a tire pressure monitoring system. The TireMinder system can monitor up to 22 separate tires, alerting you instantly to unsafe tire inflation or temperatures. To get you started, this kit comes with 6 transmitters. Flojet Portable RV Waste Pump The portable Flojet macerator pump improves one of the least favorable tasks: pumping the tanks. Using this product, you can easily dump both black and grey tanks via a standard garden hose using any convenient sewer receiver. Fresh water rinse capabilities make this one of the best RV accessories on the list! Viair Automatic Portable Compressor Kit A flat or under-inflated tire can quickly turn a routine travel day into a complicated headache. Proactively solve the issue with a portable compressor kit capable of inflating tires up to 150PSI. Victor Heavy Duty Tubeless Tire Repair Kit In addition to an air compressor, carry a tubeless tire repair kit to patch the unexpected puncture. Tire repair kits and a quality compressor should allow you to limp to the next service station! Ohuhu 12.5ft Aluminum Telescopic Extension Ladder Often, A ladder can be a lifesaver in the least expected way. Pack away a retractable ladder and you will have the unexpected covered! In summary, we hope you’ve found this year’s list of best RV accessories helpful. Which accessory, gadget, or RV tool do you depend on most? Sound off in the comments below, and until next time, keep exploring!